On Thursday 15 September, at various locations worldwide, members of the public will hand out their own money to complete strangers, asking recipients to pass half the amount on to someone else. ON Thursday 15 September, at various locations worldwide, members of the public will hand out their own money to complete strangers, asking recipients to pass half the amount on to someone else. The event aims to start conversations about the benefits of alternative economies based on sharing. 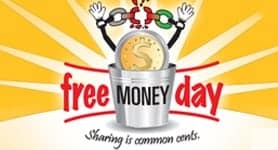 “Free Money Day is an invitation to explore, in a fun way, what it might be like if our relationships to money and our economies were a little different” said Australian Dr Donnie Maclurcan, co-founder of the Post Growth Institute, the group behind the stunt. The event is timed to coincide with the third anniversary of the collapse of the US investment bank Lehman Brothers, now seen as a turning point in the development of the 2008 global financial crisis. “With world debt at US $158 trillion and debt connected to growth economics by necessity, it would seem valuable to ask: do we always need to grow our economies?” Dr Maclurcan asked. According to Dr Maclurcan, new opportunities are emerging for workable alternatives to growth. “The rise of social enterprise and the return of collaborative consumption are showing the way towards a not-for-profit world economy by 2050” Dr Maclurcan said. Forty-three Free Money Day events are scheduled in 29 cities around the world, with people having pledged to give away the equivalent of AU $2000. Twenty-one Australian events are planned, including free money on top of Mount Perisher. Dr Maclurcan plans to give away AUD $500 at 8am, Thursday, 15 September, on the steps of Sydney’s Town Hall. More information is available at the Free Money Day event website Freemoneyday.org or you can follow them on Twitter @freemoneyday .